At 12:35 p.m. local time on February 11, 2010, Soufrière Hills Volcano on the Caribbean island of Montserrat experienced a partial dome collapse. Lasting nearly an hour, the event sent a plume 50,000 feet (15,240 meters) skyward, and sent pyroclastic flows—avalanches of hot gas and debris—some 300 to 400 meters (980 to 1,200 feet) out to sea. The pyroclastic flows destroyed many buildings in the village of Harris north of Sourfrière Hills, and the Montserrat Volcano Observatory described the dome collapse as the most severe incident since May 2006. The Moderate Resolution Imaging Spectroradiometer (MODIS) on NASA’s Aqua satellite captured this true-color image on February 11, 2010, the same afternoon that the dome collapsed. 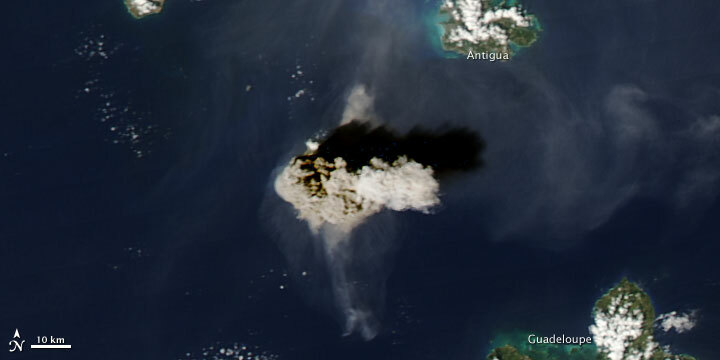 An east-west volcanic plume completely obscures the island of Montserrat, casting a shadow toward the northeast. Two smaller, fainter plumes also extend from the island, one to the north and the other to the south. The northern plume lies in the shadow of the east-west plume and consequently must occur at a lower altitude. Lava domes form fairly slowly as magma moves through a vent and accumulates around it. These steep-sided structures can reach a height of hundreds of meters and may become unstable, especially given underlying seismic activity. When a lava dome collapses, the results can be dramatic, including pyroclastic flows and columns of volcanic ash. The Soufrière Hills dome collapse on February 11, 2010, was no exception, forcing a small evacuation and disrupting local air traffic. A photo series records the events from the ground. Reaching an altitude of 915 meters (3,002 feet) above sea level, Soufrière Hills is a stratovolcano composed of alternating layers of hardened lava, solidified ash, and rocks ejected by previous eruptions. No eruptions were recorded at the volcano until 1995, when the volcano began a cycle of ash eruptions and pyroclastic flows. 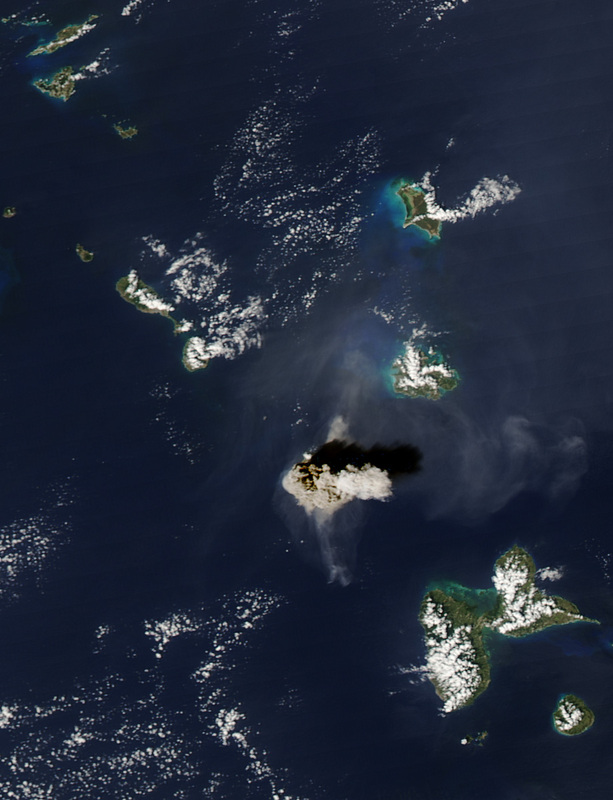 Acquired February 11, 2010, this true-color image shows a massive volcanic plume hovering over, and completely obscuring, the Caribbean island of Montserrat. Global Volcanism Program. Soufrière Hills and Types and Processes Gallery – Lava Domes. Smithsonian Institution. Accessed February 15, 2010. U.S. Geological Survey. Dome Collapses Generate Pyroclastic Flows, Unzen Volcano, Japan. Accessed February 15, 2010. Volcanism Blog. Soufrière Hills dome collapse of 11 February 2010 – “largest event since May 2006” and Large partial dome collapse at Soufrière Hills: 15 km ash plume (updated). Accessed February 15, 2010.